Two large custom High-Sider™ litter boxes are included (you get 2) with your cabinet purchase and are 22 1/2 inches Wide x 13 inches Deep x 15 inches Tall! Shipping Weight: 105 pounds (40 x 29 x 9 inches) It’s a big heavy box! Where can I put the Out of Sight Litter Box®? 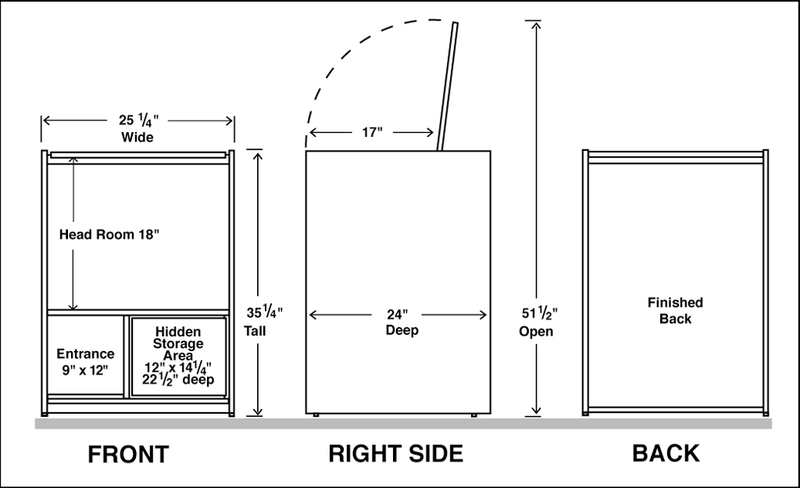 You may be thinking – I don’t have floor space anywhere to put a 25 x 24 inch cabinet. But, you will be very surprised, with all four sides finished it can go anywhere in a room. • Put the cabinet in the laundry area – and you can fold clothes on top of it. 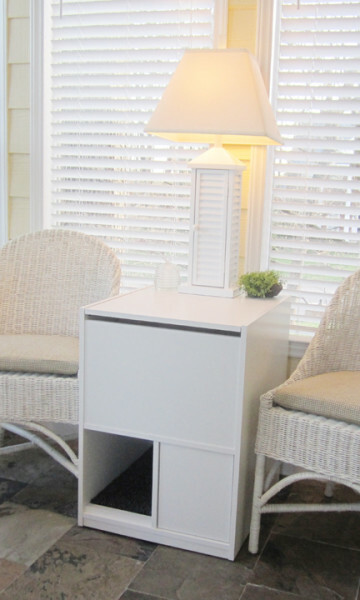 • Put the cabinet in a hallway – put a small lamp on the cabinet and light up that dark area. • Put the cabinet anywhere in a bedroom – so now the guest bathroom can be used again. • Put the cabinet anywhere in the formal living room, that you really never use. • Put the cabinet next to the sofa or easy chair, with all four sides finished, it doesn’t need to be against a wall, it looks good all the way around. Add a oooo reading lamp and you’ll have a new cozy space. • Put the cabinet down stairs – your litter pan may be out of sight down there now, but, my cabinet stops all that litter mess and litter tracking. No more cleaning! And it keeps dogs and small children out too! 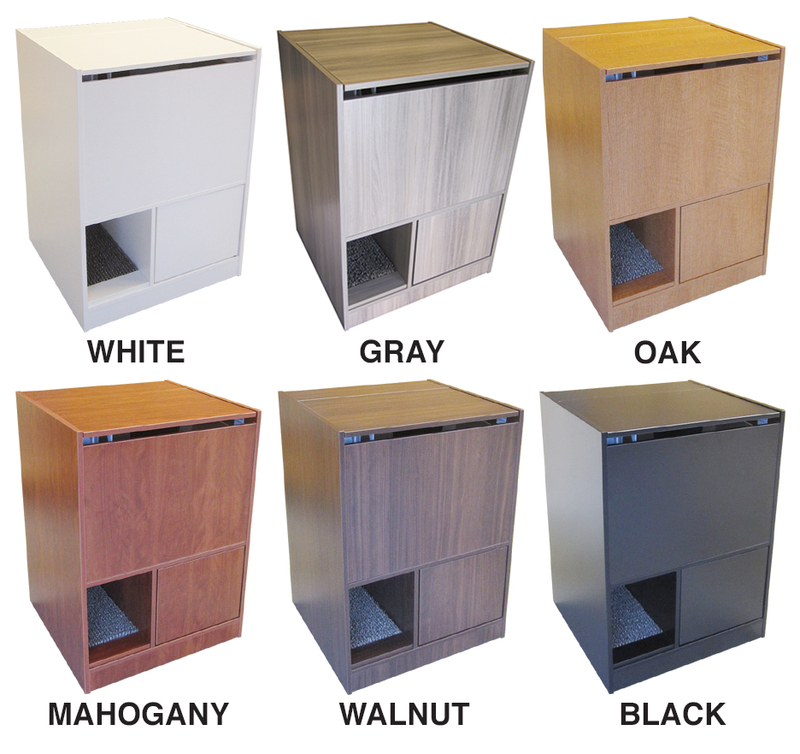 The Out of Sight Litter Box® cabinet really is not as big as you might think, you will be very surprised the many places in your home or apartment that it will fit. Take a look at my Customer Testimonial Photos and see! You’ll be surprised and grateful for the changes the Out of Sight Litter Box® will make in your litter box problems.